WTHS brings award-winning production to the stage as spring musical from March 9–11. 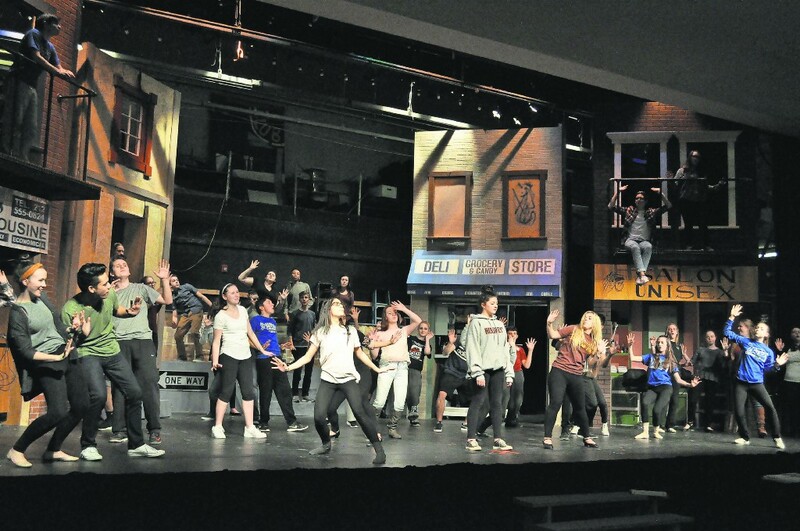 The cast of the WTHS spring production, “In the Heights” prepare for the upcoming show, debuting on March 9. Directed by Washington Township High School teacher Abby Molotsky and choreographed by Nicole Corigliano, the show will display a lot of energy with the music incorporating rap styles, and dance moves that include hip-hop and Latin. Also lending support is Vocal Director Joe Zachowski and Music Director Casey Corigliano. The lead character Usnavi, played by senior Dan McGee, is a bodega owner who dreams of leaving Washington Heights to return to the Dominican Republic. Vanessa, played by senior Nicole Bosurgi, is Usnavi’s love interest who works at a nearby salon. Senior Nadia Stracciolini plays the part of Daniella, the salon owner who is confident, boisterous and loves to gossip. Nina Rosario is the only one who makes it out of Washington Heights by attending Stanford University, but returns home with disappointing news for her family, unsure if she’s going to go back to school. Played by sophomore Alexa Liss, Nina is the typical “good girl” who finds herself falling for Benny, a boy who was taken in by the Rosario family and works for their family car service shop. The students have rehearsed six days a week for nine weeks in preparation for the musical. Since January, Set Designer Mike Repasy, Master Builders Erice Fernee and Shawn Horn, and other production team members have built a set that includes four two-story buildings, featuring functioning garage doors, a salon, a bodega and more. “I look forward to being able to share what we worked so hard on for the past couple months with everyone we care about,” senior Kyle Lucero, playing the part of Nina Rosario’s father, Kevin, said. “They’re amazing; I could not be any more thrilled at what has transpired. From the props kids to the highest lead, they are a-plus caliber kids. They’re going to be amazing,” Molotsky said. Senior Elena Levan had the opportunity this year to take a position off the stage as student assistant director. Typically performing with her peers, Levan has instead worked with Molotsky on prop lists, stage blocking and production. The cast also shared hidden traditions that take place during the performances, encouraging audience members to try to notice them as they happen. Unable to disclose specific details, the students hinted the rituals involve a fruit and the mentioning of an animal during the show. Performances will be taking place at 7:30 p.m. on Thursday, March 9 and Friday, March 10. On Saturday, March 11 the show will begin at 3 p.m. Tickets to attend are $10 and can be purchased by contacting Business Manager Shannon Molloy at smolloy@wtps.org.